Chicken Salad Sandwiches are great for picnics and sack lunches. They are super easy to make and taste great. This recipe may sound a little strange but everything mixes really well and tastes great. Total cost: About $4 and about 20 minutes time, if that. Makes about 4-5 sandwiches and keeps really well in the fridge for at least a week in a sealed container. It’s even real tasty plain, or on crackers. This recipe turned out really great. 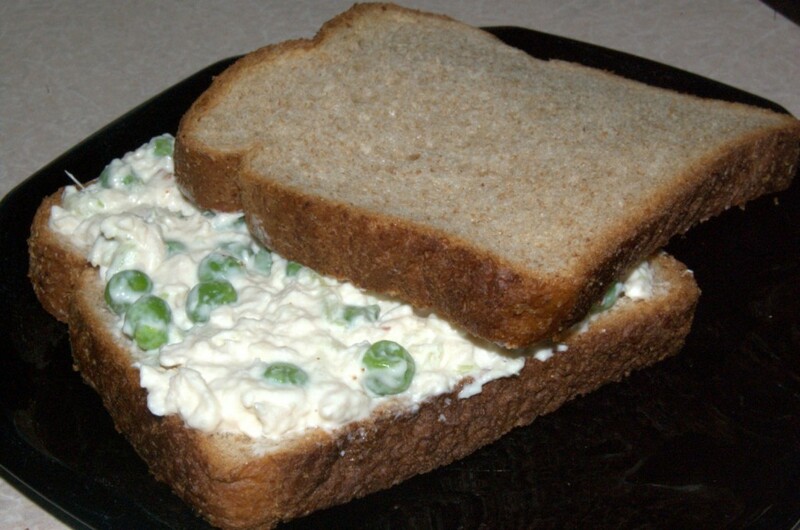 The sweet peas and miracle whip add a real nice sweet taste and a little crisp but not hard crunch to the Chicken Salad. Personally I don’t like having chopped celery or raw onions in anything like this because I don’t like that big crunch among the softer texture of the rest of the ingredients. I like to keep things consistent and that’s why I grated the celery, which gives you the fiber and a very mild taste of celery without the crunch. If you like the crunch, dice away. Using the miracle whip and less mayo than usually seen in a Chicken Salad recipe keeps this from being too greasy or tasting too much like straight mayonnaise. Some things that can be added to this recipe with success are black pepper, onion powder, onions, mustard, cayenne pepper for a little spice or even corn. Here is the Flickr stream for this recipe. This does sound pretty good. I’ll have to try it!! .-= Amanda´s last blog ..Recipe Thursday =-. Oh, it is, believe me 😉 It’s even better after a few hours in the fridge when everything is nice and cold.